On a recent Instagram browsing session research expedition, I accidentally stumbled on Amy (aka amyvnwijk)'s colourful account, and was immediately captivated. 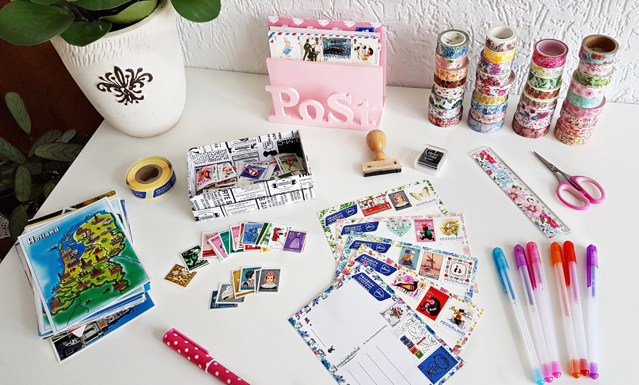 The stamps, the washi tape, the airmail stickers… Her creations are awe-inspiring, every postcard a miniature piece of art! I was curious to find out more about her mailings, and luckily, Amy agreed to answer a few questions about it, so we had a mini-interview! Here she is to tell us more about her gorgeous postcards. Can you tell us a little bit about your decoration process? What inspires you? I start with choosing the stamps. If it’s a certain season or holiday I like to use stamps and tapes complementary to that. If I go for a colored theme I match the colors of the stamps together with a same colored washi tape. I always begin by making a border around the card with the washi tape. Sometimes I use small tape but if the tape is a little wider I cut of the excess with a scissor. Then I stick on the stamps and the priority label. Finally I use rubber stamps. While the ink of the rubber stamp is drying I go to the next card and when everything is decorated I start writing. 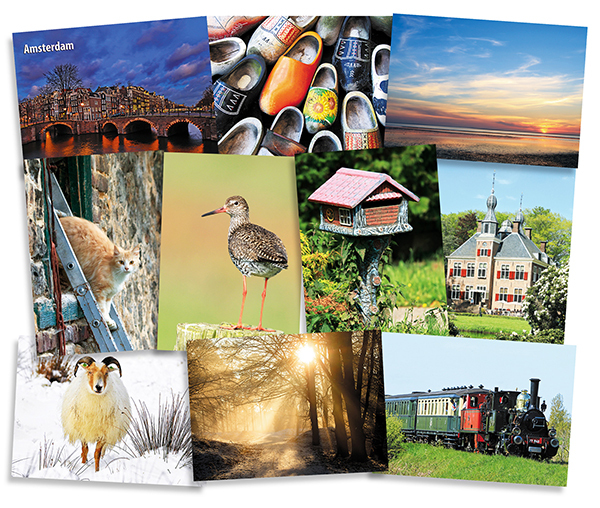 Which materials do you use to decorate your postcards? I mainly use washi tape and rubber stamps to decorate my postcards. My favorites are tapes with floral prints because they are always very cheerful. 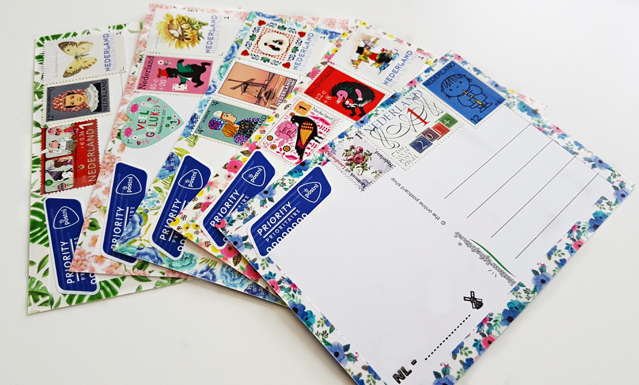 I also like using rubber stamps — for official Postcrossing cards, I use a Postcard ID-stamp. For writing I use colored gel pens or fine liners. As an extra stamp I like to use an old Dutch “gulden” stamp. 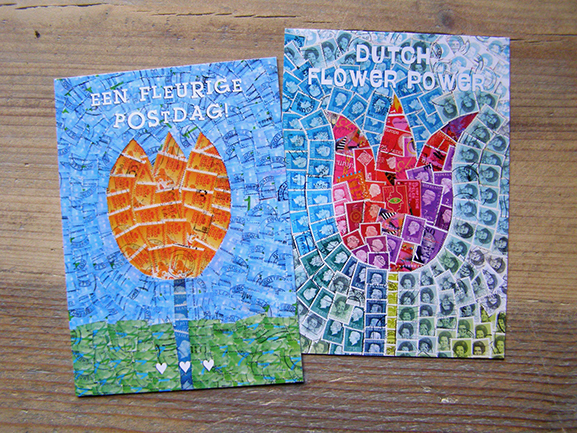 They are no longer allowed as postage but I think they are beautiful and a nice decoration to the card. Some other useful materials are a pair of (small) craft scissors, a ruler and a retractable knife. I try to stay away from glue or really sticky deco tape because it’s easy to stain the card and hard to correct when you make a little mistake. Paper tapes, like washi tape, are a lot easier to remove when you decide to go for something else or need to make an adjustment. What are the member’s reactions when they receive your postcards? Do they appreciate the extra effort? I love choosing and decorating cards the best from the whole Postcrossing experience! I enjoy sending happy and colorful mail and when I read on the profile that the receiver likes it as well, I get excited straight away. Sometimes it’s a bit of a gamble if the receiver would appreciate it, but I’ve received a lot of positive feedback on my sent cards so far. A few weeks ago a woman wrote in her hurray message that she would frame my card — that really made my day. And finally, can you show us the place where the magic happens? My desk is also my work and laptop table so when the addresses are requested the laptop goes to the side so I have enough room for my craft supplies. I keep everything in basic storage boxes in a cabinet so when the crafting and writing can start I bring everything I need over to my desk. Thank you Amy, that was lovely — I’m really inspired to beautify my postcards now! 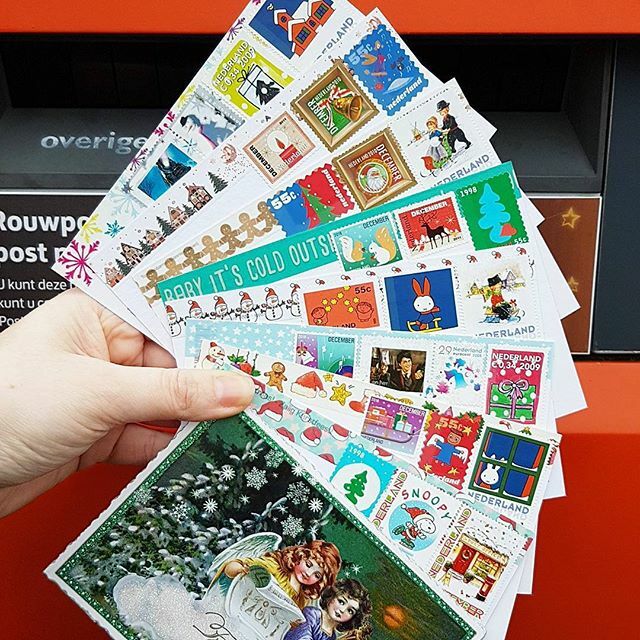 Do you decorate your postcards too? If so, share your own tips below! It’s been a while since we’ve had a giveaway here on the blog, so we thought it was time to bring them back! 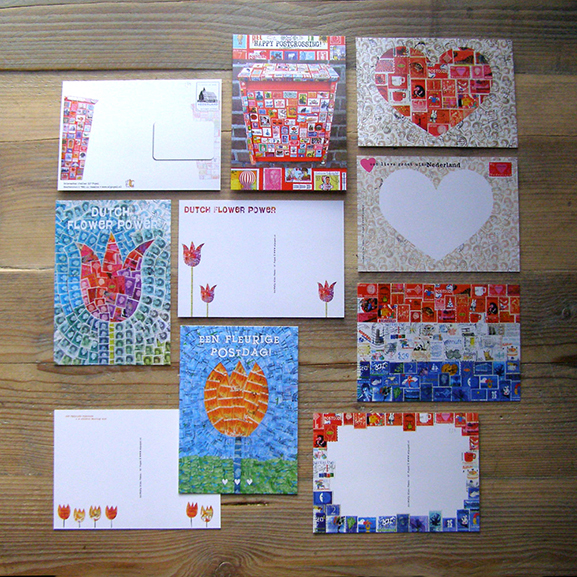 Partnering with us this month is Kaartfanaat, a lovely Dutch postcard shop we’ve featured here on the blog some years ago. They’re still going strong and have since expanded their range to feature not just great postcards, but also boxed sets, books and other gifts. Lots of series will be familiar to postcrossers, from Fotofolio's black and white cards featuring famous people to Inkognito's humourous ones… there’s something for everyone! To win one of these fantastic prizes, browse Kaartfanaat's website and leave a comment below, telling us which postcard, series or gift item you have your eye on! Good luck, everyone! Check back on this post around this time next week for the winners, which will be randomly picked by Paulo's number generator, as usual. PS – For the duration of this giveaway, Kaartfanaat is also offering a 10% discount on all orders from €10 (excl. shipping). Use the code postcard during checkout! 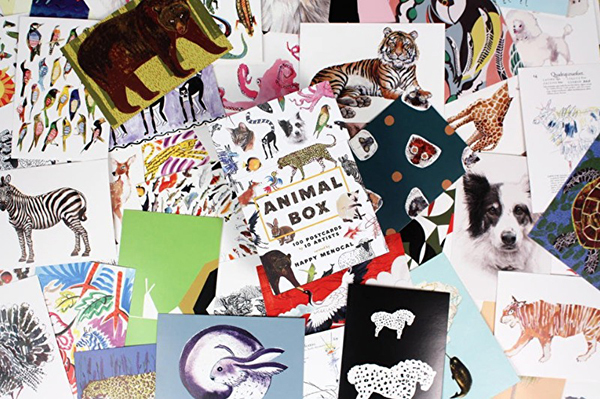 As lovers of all things snail-mail related, we have a soft spot for postcards featuring postal themes. So naturally, when this particular postcard crossed our paths some time ago, it was an instant favourite! Isn’t it a lovely combination? At the time, we hadn’t realised this particular mailbox actually existed and is was being used daily to receive mail… until one day, someone sent us an email to bring it to our attention! 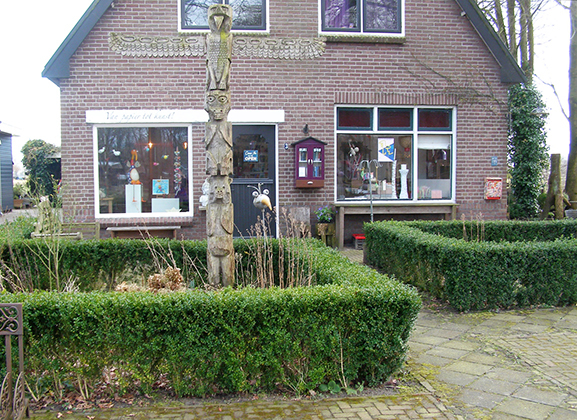 That’s when we learned it belongs to Ellen’s (aka Elfje66) and is hanging outside her studio, in the Dutch village of Zweeloo. 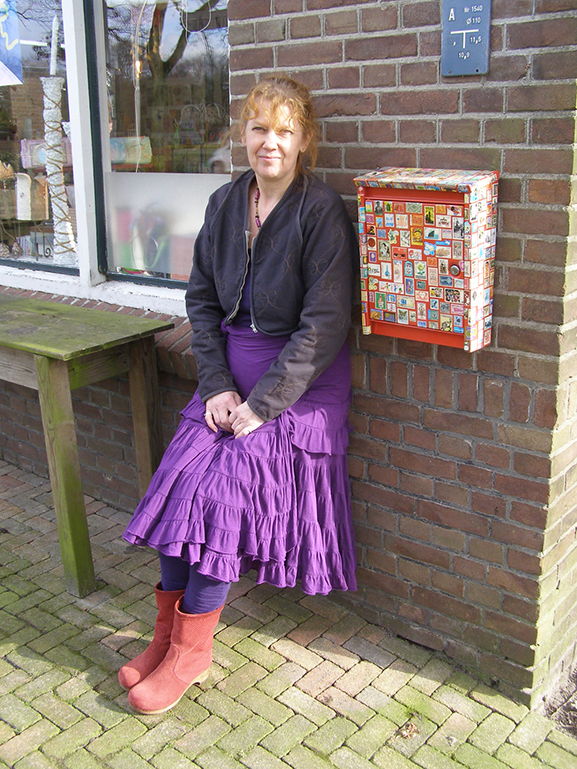 Ellen is a paper artist, and we were happy to talk to her a little bit about her unusual mailbox, and her art works. Where did the inspiration for your mailbox come from? In the beginning of 2015 I started to join a 'Stamp my Journal’ project. I fell completely under the spell of making stamp-collages. 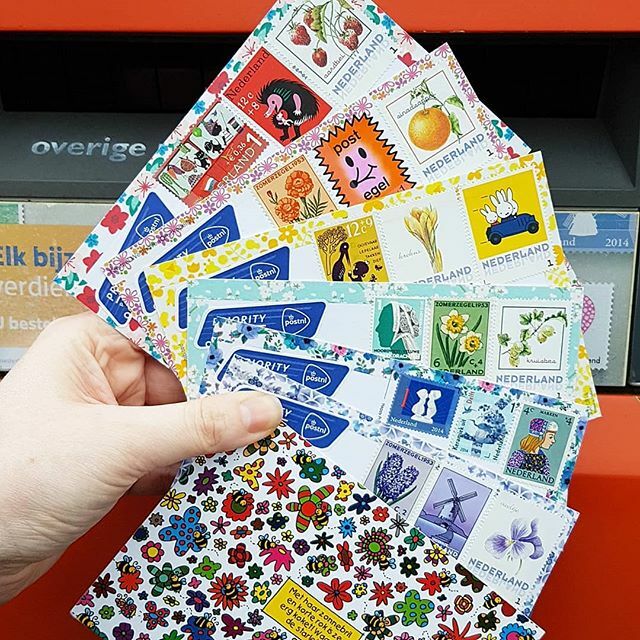 Since my studio is called El’ Papel (as I am an absolute paper-lover even since I was a little child) I thought it would be great to decorate my mailbox with stamps too! El’ is short for my first name: Ellen and the P from Papel is also the first character of my second name: Peeks. When I started designing and my own company I visited Spain frequently, so that was also a reason for choosing this name. Besides that, I found a lot of insertion in the Spanish culture. Is it visible from the street? Did other people (or your postman!) notice? What did they say? Yes, it is visible from the street! When it was placed on the wall our mailman at that time didn’t respond at it at all! I was really disappointed! But he was a moody man… Now we have several mailman (man and woman) and they noticed as soon as we took the mailbox from the wall, as it needs to be redone a bit. Unfortunately most stamps aren’t printed with UV resistant ink :-( So some stamps lost a lot of their color. 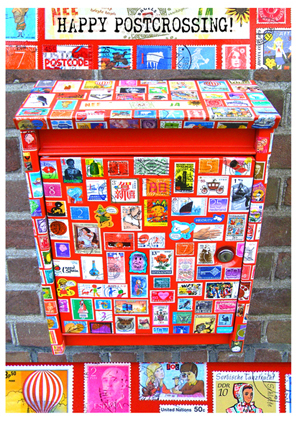 What do you do, apart from creative mailboxes? I graduated as graphical & typographical designer. But I work mostly as illustrator, designer of birth announcement cards and making merry paper maché objects (mostly fantasy animals). And I like to upcycle used materials. So stamps fit fairly good with this vision. 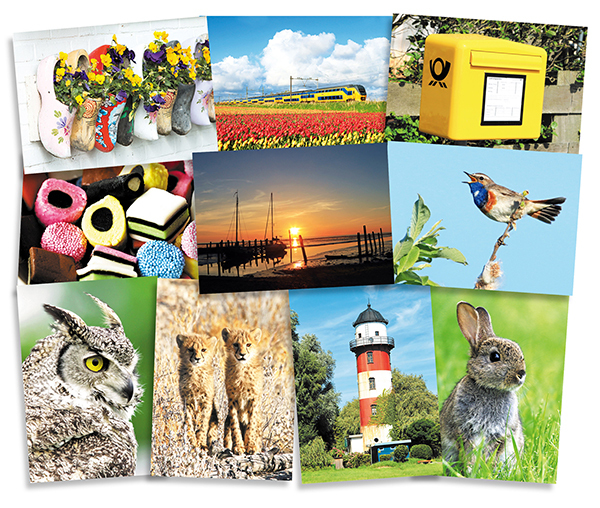 How did you find out about Postcrossing? I remember reading about it in the lovely magazine Flow, but forgot all about it. At some point I noticed a dear (post-)friend of mine showed a lot of foreign cards on her Facebook page. I asked her about this and she told and explained me about Postcrossing. She never should have done, as it is quite addictive ;-) In the meantime I join some Dutch Postcrossing groups on Facebook, big fun! We have meetings, what is very convivial. I now have some special post-friends spread across our little country! A special postcrosser: Corry1919 from the Netherlands! 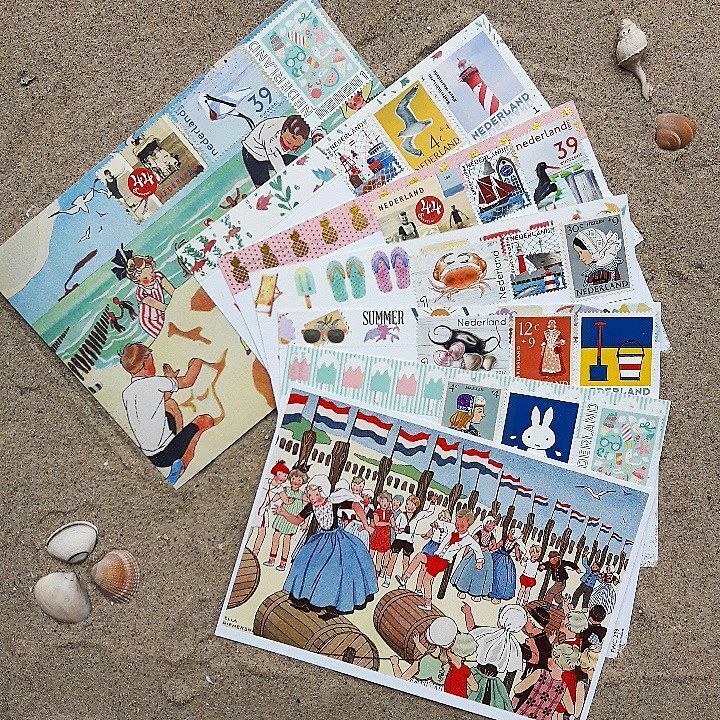 Disclosing one’s birthday isn’t a requirement in Postcrossing, but it does allow us to compile statistical data, send you an email on your special day, and occasionally, spot some cool postcrossers… like Corrie (aka Corry1919) from the Netherlands! 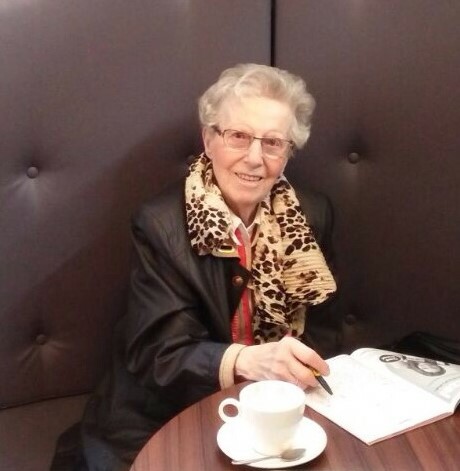 From them, we learnt that Corrie Loos was born on May 25th, 1919 in Wognum, a small village in West-Friesland. She’s the fifth child in a family of eight siblings and used to work as a housekeeper and later in a butcher shop until she retired at the age of 65. Because of her beautiful handwriting, she was recommended in the thirties to apply for a position at the Land Registry. She did, but was rejected for health reasons… though you’d never guess it looking at her now 96 and still in good health! 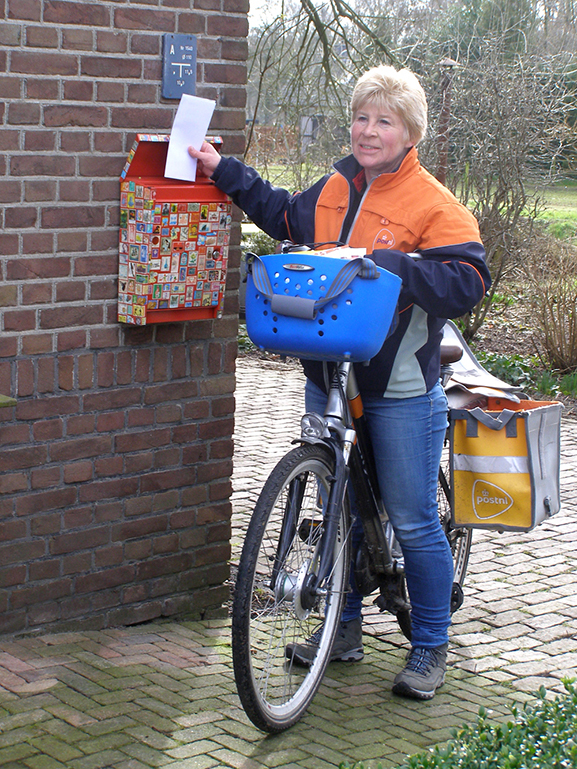 :) To know more about her relationship with mail and Postcrossing, we asked her a few questions. Corrie, what is your first memory of writing letters and postcards? When I was young I sometimes got a postcard for my birthday. Later, when I was on holidays I would always send postcards to my family and friends. I have also corresponded for many years with a Hungarian girl who had moved from Hungary to the Netherlands. She has lived with my family for many years and in the sixties, she moved back to Budapest. From then on, we regularly sent postcards to one another to keep in touch. Internet was not available in those years of course. 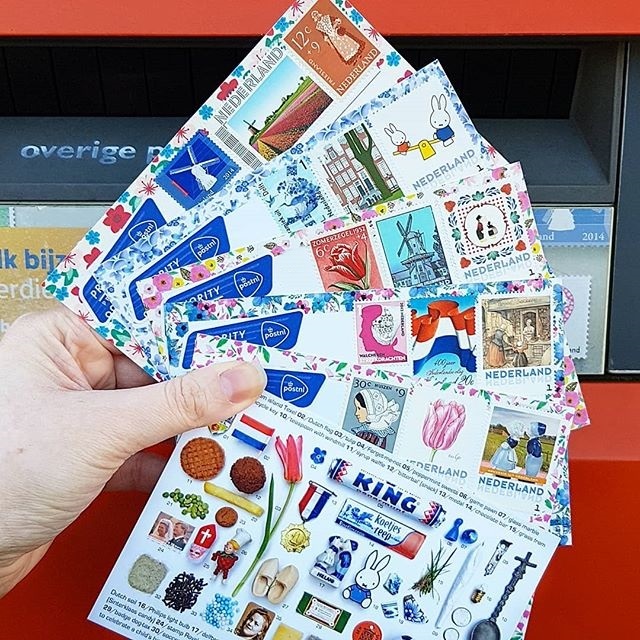 How did you hear for the first time about Postcrossing? My niece Marry was already a postcrosser and she thought it was a lovely idea to create also an account for me. She made Marian, another niece of mine, also an enthusiast and then ‘suddenly’ I got postcards from all over the world! Now that I am old and my legs are painful, I don’t go out much anymore. But with Postcrossing the world comes to me at my home! It is always a great joy when I find new postcards in my mailbox. My favorite card I got from Aats and Nica (aka aatsnica) from Estonia. 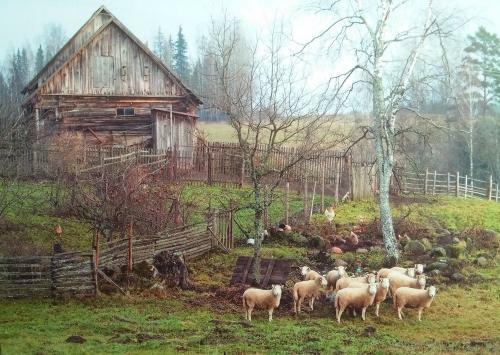 There is an old barn on it with some sheep and chickens, very beautiful! 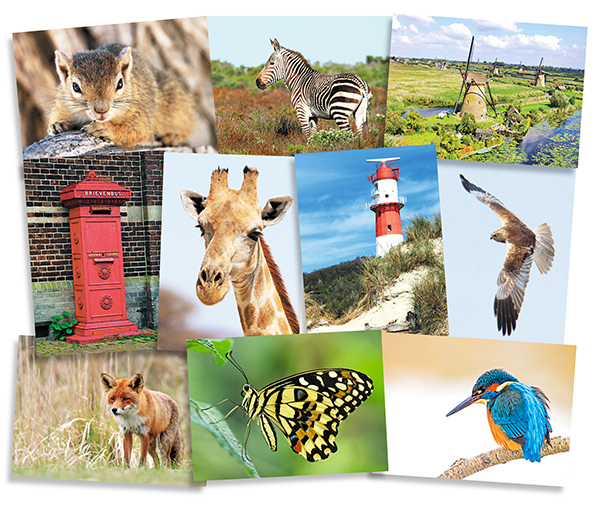 How does Postcrossing work for you? What can you do yourself and on what parts do you need help? My nieces Marry and Marian actually do most of the work. They write and translate the cards and put the pictures on my profile. Every week my niece Marian visits me. She then brings her laptop and a stack of new, unwritten postcards with her. First she translates for me the cards I received that week and then we read about the details of the new Postcrossers we are going to write and look for suitable cards. So my nieces keep me very much involved with Postcrossing, which is, I think, a modern version of an old-fashioned way to connect people with one another from faraway places. What do other people think about your hobby? They love it! I live in a retirement home and sometimes my neighbours visit me of course. I think they are a bit jealous. They always ask how it is possible that I get so many beautiful cards. The nursing staff speak some English and translate the text when I receive a new postcard. They are also always very curious if I have got new cards again. How has mail changed during your lifetime? Is there anything that was particularly different before, compared to now? Yes it is! Previously we wrote and received many letters, nowadays almost everything goes through the e-mail. Even the bills you get are digital. Therefore, the postal traffic is becoming increasingly expensive. I’ve got a card from my father in 1937 with a stamp on it of 1.5 cents. Nowadays you have to pay 73 euro cents for a stamp; you could send a hundred postcards for that, back then! Can you imagine that! And if you would send a card with a short or incomplete address, it would still come to the right house. During the war my younger brother was sent to Germany to work there. When for the first time we got a letter from him, it went like wildfire through the village. Everyone wanted to read it, the world was so much smaller. 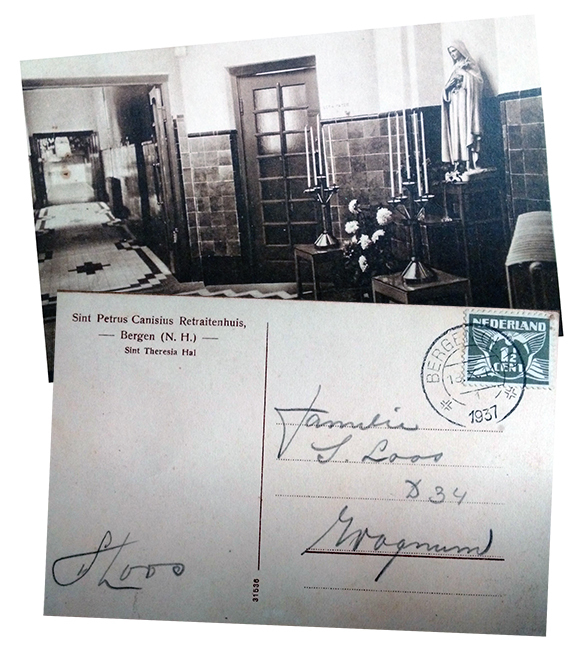 Postcard sent by Corrie’s father from Bergen to Wognum in 1937. Thank you Corrie, Marry and Marian for this wonderful interview!